This is the 5th square of the 2018 Knitterati Gradient Lapghan. Long loops drawn up between the decreased stitches create a pretty textured fabric. 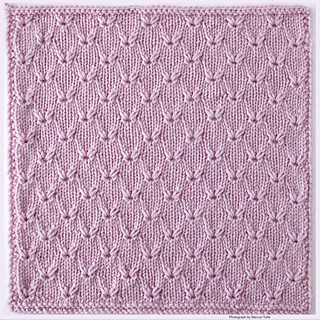 20 sts x 28 rows = 4” (10 cm) over Stockinette stitch using US 7 (4.5 mm) knitting needles. Row 4: Sl1 wyif, K1, P to last 2 sts, K2. Row 10: Sl1 wyif, K1, P to last 2 sts, K2.